MEH. Wait. Wait. I am getting ahead of myself. I enjoy Pringles. I love Loud. I love cheese. 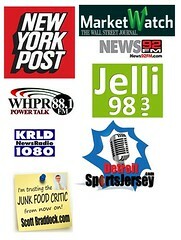 I love Italian flavors and foods. I did not love these. There was this after taste that was ….meh. 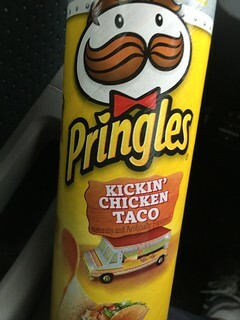 Pringles has something called “Kickin’ Chicken Taco” crisps from their “Food Truck” line. These are just….usually awful. I can’t even think of other words to use. Your experience may differ. Yes. They have them now. 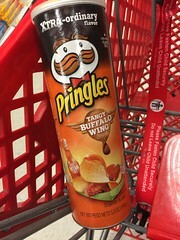 White Chocolate Peppermint flavored Pringles. 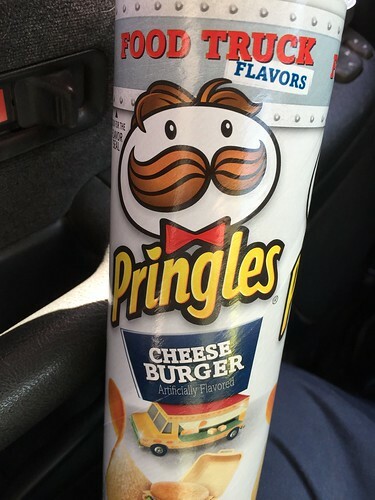 One might think you had me at “Pringles”. 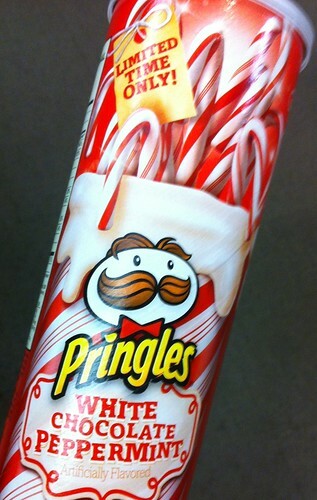 But these probably sounded awesome at the I-am-totally-hammered-at-pringles-2011-xmas-party. The people I shared these with thought they were super interesting until the taste. The sweet and peppermint say hello but are immediately interrupted by that salty potato flavor. Betcha you could only eat just one. I know I did.